http://www.fivesevenammo.com" onclick="window.open(this.href);return false; Check out this site holsters for MKII 5-7, also for mag carriers at very good prices. Here is a new holster for all of the MKII owners out there. I just found out that Blackpoint tactical is now making OWB holsters both in full kydex and leather wing in all kinds of colors. Heres their website and a pic of mine. Has anyone found a company making a IWB holster for the MK2 that's not all kydex? Looking for something similar to a Crossbreed super tuck. Horse hide against the body with a kydex outside. Take a look at the Minotaur Spartan by Comp-Tac. Its the Kydex/Leather hybrid that you're looking for, I think. I've been using one for about three years now and I really like it. Thanks for the reply, but they only make a holster for the USG, just like all the other companies I've researched. I have a supertuck from when I had my USG. The MK2 fits in it, but would cause excessive wear if repeatedly used. Hence why I'm looking for something specifically for the MK2. If you're looking for a Galco leather shoulder rig, I have a new one. blueorison wrote: If you're looking for a Galco leather shoulder rig, I have a new one. I appreciate the offer, but I'm just looking for an IWB, that's not all kydex for my MK2. shopsmart wrote: Called black hawk, looked at my invoice, FN 57 USG. Should work, but mentioned adjustable sights and balckhawk mentioned that might be an issue. Still scratching my head and also occured to me the wrong holster might have been in the package. The packages were easily opened and people messing with them might have been fiddling around and put the wrong holster in. Anyone with a FN 57 USG adjustable sights with blackhawk serpa. Pics please. I am stumped at this point. The SERPA will fit ANY 5.7 pistol...period. What do you want for the Galco? Is it a universal adjustable fit? This runs counter to what Blackhawk is saying; the SERPA will fit the USG but not the Mk. II. Wow, I missed that comment before. The SERPA will also not fit the IOM models. We will be offering a paddle version of the holster we currently carry and it fits ALL FsN models from the MKII all the way back. Any word on availabity yet? They will be up next week. 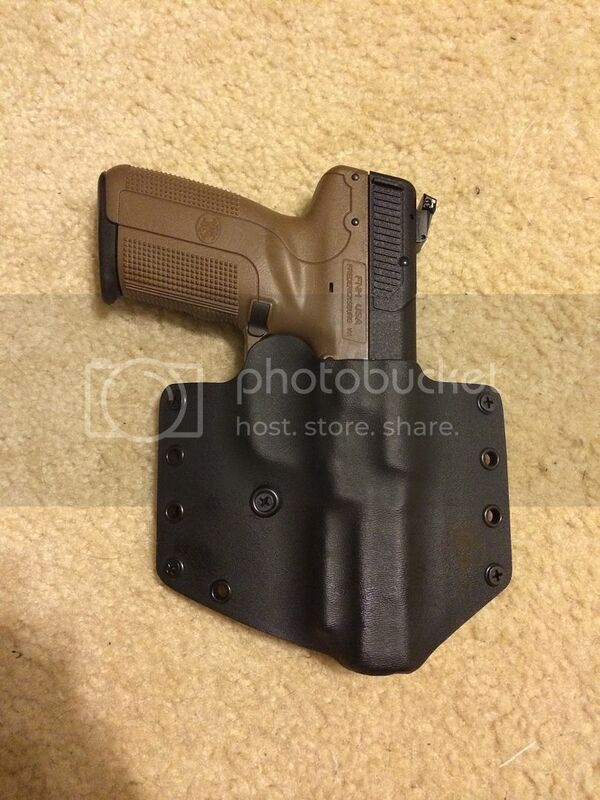 I ordered a paddle holster on 11/11/14 from MultiHolsters. It arrived today (less than a month, with an expected 8-10 week lead time). It is no-frills black, no laser, etc. Fits the FIveseveN MK2 perfectly. I did specify the MK2 model in the description and they came through. I bought this one for more of a putzing around the property option, and to check out their quality. When I look for some more carry options for this firearm, they will get more of my money. I will likely try their 2-in-1 next. I do have an order in for Aliengear as well, but nothing has shipped yet. I just received my MK II, there is no way in hell it will fit in either of my Serpa's I used with my original 5.7. I even considered trying to modify the Serpa for the MK II, there is not enough material in several locations to allow it. Serpa fit pretty damn tight. I have an older one and I would not consider even trying to fit a MKII into it.